Editor's Note: This article is part of our ongoing coverage commemorating 25 years of the PACE Awards for supplier innovation. For more about the program, visit the PACE Awards site. Cars and trucks already have enormous computing power under the hood. But they will need a lot more if the industry evolves to produce safe, fully autonomous vehicles. To commemorate 25 years of PACE Awards for supplier innovation, Automotive News each week looks back at one of the many winners. 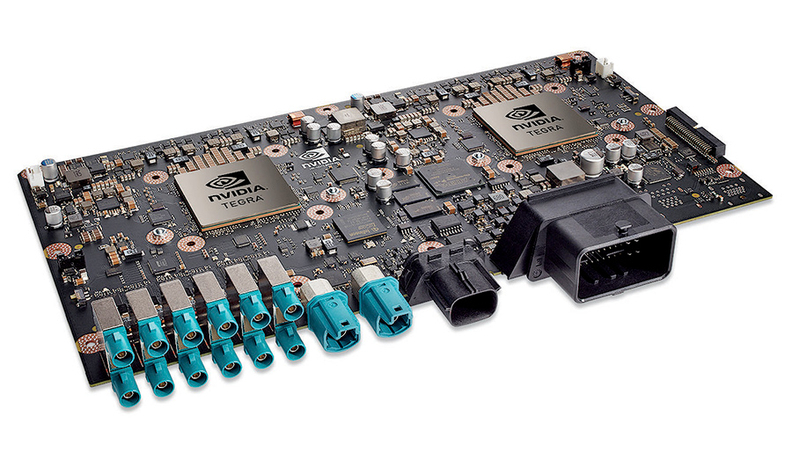 Innovation: Chipmaker Nvidia put artificial intelligence in a platform that can scale up as automakers move from assisted driving to autonomous vehicles. Why it resonated: Automakers need computing power for autonomous vehicles that will adapt from where they are today to where they want to be in a few years. Enter Nvidia. The chip producer made its name by turning computer code into ever-more-realistic graphics for video games. About a decade ago it decided to enter the auto industry, and now it turns real-world data from cars, trucks and their surroundings into the necessary code to control vehicles. In 2017, Nvidia won an Automotive News PACE Award for its Drive PX 2, an artificial-intelligence car computer that's a platform for building self-driving vehicles as technology advances. Vehicle autonomy comes in various levels, ranging from offering safety assistance to fully handling the driving. In much the same way, Drive PX 2 scales from a palm-sized, energy-efficient module for low-level smart cruise capabilities, up to a powerful AI supercomputer capable of autonomous driving. It can understand in real time what's happening 360 degrees around the vehicle, precisely locate itself on a high-definition map and plan a safe path forward by combining machine learning with those other skills. In other words, it learns from experience how to become a better driver. Tesla Inc. uses Drive PX 2 in its Autopilot driver-assistance system. Audi, Toyota and Volvo also have signed on to put the platform in future vehicles.